Like their subject matter, it appears that vampire movies will never die. The genre gets a bit of a twist with Twilight, the tale of teen bloodsuckers. Bella Swan (Kristen Stewart) moves to a small town in Washington state to live with her father Charlie (Billy Burke). Though Bella’s quiet and introverted, the novelty of a new student in a tiny burg makes her the toast of the town. Bella learns of the Cullen family, a clan of super-attractive foster kids who live under the umbrella of Dr. Cullen (Peter Facinelli) and keep to themselves. Oddly, Dr. Cullen likes to pair up the foster boys and girls, so most fit into couples, but mysterious Edward Cullen (Robert Pattinson) goes solo. 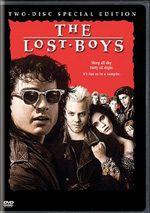 However, that doesn’t mean Twilight rips off Lost Boys - or even resembles it more than superficially, really. Lost Boys was more of an action comedy, while Twilight emphasizes romance. Sure, it tosses in some inevitable action as well, but the tale focuses on the seemingly doomed relationship between Bella and Edward. Though Twilight features only that one serious twist, it’s a good one, and it creates a surprisingly interesting flick. Back when it ran theatrically, a female friend of mine told me how much she liked it. I scoffed, as I couldn’t figure out what a 38-year-old woman got from fare apparently intended for teens. If I couldn’t understand what appeal the movie would have for a 30-something woman, I sure couldn’t discern any potential it would have for 41-year-old male me. I guess I shouldn’t judge a book by its cover – or a movie by its ad campaign and fan base. Clearly Twilight works best for teen girls, as they remain its primary audience. That doesn't mean it can’t succeed with other demographics; the female crowd will probably take more from it, but the guys can find elements to like as well. Stewart’s Bella also feels real. The movie nails the insecurities of teen girls; for instance, when Bella meets Edward’s family, she frets more about whether or not they’ll like her than whether or not they’ll eat her. Stewart displays the character’s personality well. 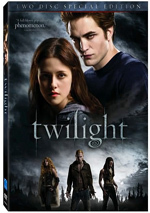 Twilight appears in an aspect ratio of approximately 2.40:1 on this single-sided, double-layered DVD; the image has been enhanced for 16X9 televisions. Most of the transfer looked good, but some issues appeared at times. Some of these came from edge enhancement and artifacts. I noticed moderate haloes at times, and some mosquito noises also marred the presentation. A few mild instances of shimmering and ropiness also affected definition, and sharpness was a little erratic. While most of the movie appeared pretty concise and accurate, occasional instances of softness occurred. Source flaws remained absent. No one expects a vampire movie to boast a vibrant palette, and when that flick comes set in the gloomy, rainy Pacific Northwest, the potential for colorful material takes an even greater dip. Despite a few golden scenes, the vast majority of the flick took on a cold metallic blue tint. Within those parameters, the hues looked appropriate. Blacks were dark and tight, while shadows showed good clarity. Overall, this was an erratic presentation that deserved a “B-“. As for the Dolby Digital 5.1 soundtrack of Twilight, it seemed positive, though not especially ambitious. Only a smattering of action sequences opened up the piece in a moderate way. The thunderstorm baseball scene was the most dynamic, though a few fights added some zing. These were exceptions to the rule, though, as most of the movie stayed with atmospheric elements. Music showed solid stereo imaging, though, and provided good reinforcement from the rear speakers. Audio quality always satisfied. Music was lively and full, with good dimensionality. Effects came across as accurate and tight; they boasted nice punch when appropriate. Speech also appeared crisp and well-defined. No edginess or other issues marred the presentation. While I didn’t think there was enough pizzazz on display to merit a grade above a “B”, I couldn’t complain about the results. We find a good array of extras across this two-disc set. On DVD One, we open with an audio commentary from director Catherine Hardwicke and actors Kristen Stewart and Robert Pattinson. All three sit together for this running, screen-specific look at sets and locations, cast and performances, stunts and effects, music, and production trivia. The commentary starts slowly and never really gets into a groove. That doesn’t mean it lacks charms, though. Hardwicke provides a reasonable amount of movie info, and Pattinson’s tendency to make fun of himself adds humor. Unfortunately, the track just doesn’t gel in a terrific manner; it sags at times and doesn’t quite come together. Still, it boasts enough charms to merit a listen. Five Extended Scenes fill a total of nine minutes, 20 seconds. These include “Are People Talking About the Cullens Again?” (1:56), “James, Let’s Not Play With Our Food” (2:03), “You Don’t Know How It’s Tortured Me” (2:19), “A Hundred Years Worth of Journals” (2:13) and “Don’t Read Charlie’s Mind” (0:49). Of these, “Cullens” seems good, as it fleshes out some backstory in a satisfying manner. The others feel more redundant, and even tedious in the case of “Tortured”. Each clip comes with a short introduction from Hardwicke. She offers perfunctory remarks to set up the scenes but she doesn’t tell us any details about them. Two musical bits appear as well. These show Muse Performing “Supermassive Black Hole as well as music videos for “Decode” by Paramore and for “Leave Out All the Rest” by Linkin Park. The Muse clips features some remarks from Hardwicke and author Stephenie Meyer before it shows the band as they play their tune live. It’s not a bad song, but it’s a pretty dull presentation. As for the two videos, “Decode” also provides short comments from Hardwicke about the song. That clips itself gives us standard “music videos from movies” fare, as it combines lip-synch footage and film snippets; it almost tries to tell a story with the bandmembers, but it doesn’t work too hard at this. I have no idea why the Linkin Park piece is called a “video” when it’s another live performance with link to the movie whatsoever. Heck, we don’t even get another intro from Hardwicke! At no point does it threaten to become memorable. A few ads open DVD One. We get clips for Band Slam, Astro Boy, and Push. Over on DVD Two, the big attraction comes from The Adventure Begins: The Journey from Page to Screen. The documentary lasts 54 minutes, 30 seconds and provides notes from Hardwicke, Stewart, Pattinson, Meyer, screenwriter Melissa Rosenberg, extras casting Danny Stoltz, visual effects supervisor Richard Kidd, producers Wyck Godfrey and Greg Mooradian, special effects foreperson Lawrence “Quasi” Decker, stunt performers Richard Volp, Colin Follenweider, Paul Darnell and Helena Barrett, 2nd unit director Andy Cheng, 2nd AD Thomas D. Coe, editor Nancy Richardson, and actors Peter Facinelli, Elizabeth Reaser, Ashley Greene, Jackson Rathbone, Cam Gigandet, Edi Gathegi, Rachelle Lefevre, Kellan Lutz, Nikki Reed, Justin Chon, Michael Welch, Gregory Tyree Boyce, Taylor Lautner, and Billy Burke. “Journey” looks at aspects of the book series and its adaptation, cast, characters and performances, Hardwicke’s approach to the film and pre-vis planning, stunts and various effects, locations, editing and music. While it can be viewed as one long program, it really provides seven shorter ones, and that makes it erratic. On the negative side, “Journey” sticks with its episodic nature in such a way that it lacks much coherence. We zoom through subjects without great depth and don’t learn as much as we’d like. This is particularly true for issues related to the novel/script adaptation, editing and music; these come out as loose overviews at best. “Journey” does succeed when it comes to the subjects of footage from the set, stunts and effects. We find tons of shots from the production, and we learn quite a lot about the various sorts of effects and stunts. Those areas function well enough to make “Journey” useful, even if it remains erratic. Five more Deleted Scenes appear. After a 24-second general intro from Hardwicke, these occupy a total of five minutes, 27 seconds. They include “Edward, She’s Not One of Us!” (0:58), “That’s the First Time I Dreamt of Edward Cullen” (1:18), “Bella, Your Number Was Up the First Day I Met You” (1:48), “She Brought Him to Life” (0:43) and “I Love It When Men Chase Me” (0:42). Maybe big Twilight fans will get more from these clips than I do, but frankly, most seem pretty dull to me. “Chase” probably should’ve stayed in the flick since it adds much needed exposition to the “bad” vampires, but I can live without the others. Once again, the running times include intros from Hardwicke. Once again, she tells us little of interest. Next we find a featurette called The Comic-Con Phenomenon. The show fills seven minutes, 59 seconds as it shows the reception the Twilight cast and crew got from a heavily female Comic-Con audience. This means challenging queries like “what’s it like to play a super-hot vampire in a movie?” Expect a whole lot of screaming. Literally, every statement uttered by a panel participant ends with wild squealing; someone could say “I’m sitting at a table” and the crowd would go crazy. We get a whole lot of hype but not much real information. A few promotional components appear under Theatrical Campaign. Under this banner, we find “Sneak Peek as Seen on Penelope DVD” (3:24), “Comic-Con New York Sneak Peek” (4:22), “Teaser Trailer #1” (0:59), “Teaser Trailer #2” (1:16) and “Final Trailer” (2:24). “Sneak Peek” includes comments from Rosenberg, Meyer, Pattinson, and Stewart before it shows snippets from the film. “Comic-Con” features Stewart, Meyer, Hardwicke, Pattinson, Facinelli, Reaser, Greene, Rathbone, Lutz, Reed, Gigandet, Lefevre, and Gathegi. We see little of movie, as the emphasis here is on behind the scenes shots and story/character synopses. The content of the trailers is pretty straightforward: they advertise the movie. (Surprising, isn’t it?) All are pretty average; none include unique elements or anything to make them stand out from the typical trailer. As one far from the film’s target demographic, I expected little from Twilight. However, it turned out to be a pretty interesting flick, and to my surprise, its weakest parts came from those I thought I’d like the best. The DVD presents erratic but acceptable picture as well as good audio and a fairly interesting roster of supplements. Twilight provides an involving film and a generally positive DVD.